Purchasing a new RV mattress doesn’t have to be a difficult endeavor, it’s actually quite simple. 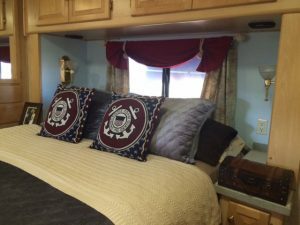 Purchasing the right type of RV bedding for your camper can be a complicated, and sometimes annoying, process. You have to consider important factors such as the size of the bed, the type of mattress filling you want, and deal with the whole ordeal of replacing the mattress itself. Remember, a full-sized RV bed might not be the same size as the one that’s currently in your camper. Remember to keep measurements in mind when you’re out looking at new RV mattresses and camper cushions (if necessary). A queen or king size can essentially be shorter than you’re accustomed to. Many RV’s sell specially made bedding that’s designed to fit an RV. So, if you want to save a trip back to the mattress store for a refund, be sure that you consider the mattress measurements beforehand. RV mattresses may sound unappealing and uncomfortable. However, many mattress manufacturers are producing high quality foam cushions to mimic the exact feel that a regular mattress would feel like. For instance, you can even purchase a memory foam mattress for your RV, so it’ll feel like a home away from home. RV owners can enjoy the comforts of a high quality mattress simply by finding a manufacturer that specializes in creating these products. By doing a little research on the type of mattress that you want, along with accurately measuring your space, you’ll spruce up your RV’s bedroom in a jiffy!